MDC Partners is a Business Transformation Organization that utilizes technology, marketing communications, data analytics, and strategic consulting solutions to drive meaningful returns on marketing and communications investments for multi-national clients. In 2011, MDC sought to create an immersive experience in its new Manhattan headquarters. From the outset, the MDC Partners Innovation Centre was designed to embody and nurture MDC’s entrepreneurial mission and spirit of innovation. To bring this to life, CP+B, an MDC Partners agency, conceptualized and developed the content of the space, while HB Communications, Inc. was hired to select and implement the proper equipment to bring this state-of-the-art environment to life. MDC Partners is a Business Transformation Organization that utilizes technology, marketing communications, data analytics, and strategic consulting solutions to drive meaningful returns on marketing and communications investments for multi-national clients. In 2011, MDC sought to create an immersive experience in its new Manhattan headquarters. From the outset, the MDC Partners Innovation Centre was designed to embody and nurture MDC’s entrepreneurial mission and spirit of innovation. To bring this to life, CP+B, an MDC Partners agency, conceptualized and developed the content of the space, while HB Communications, Inc. was hired to select and implement the proper equipment to bring this state-of-the-art environment to life. The scope included three integrated video and audio conference rooms with presentation capabilities, iPad controls along with Crestron touch panels, fully digital video systems, and collaborative tools such as Smart Tech overlays and a Smart Tech sympodium tablet. A terrace area and café area, equipped with music capabilities, speech reinforcement, and the ability to project video utilizing an HD projector, allows the space to easily transform from a casual lunch area to an event and conference venue for clients and partners – all via an iPad controller. 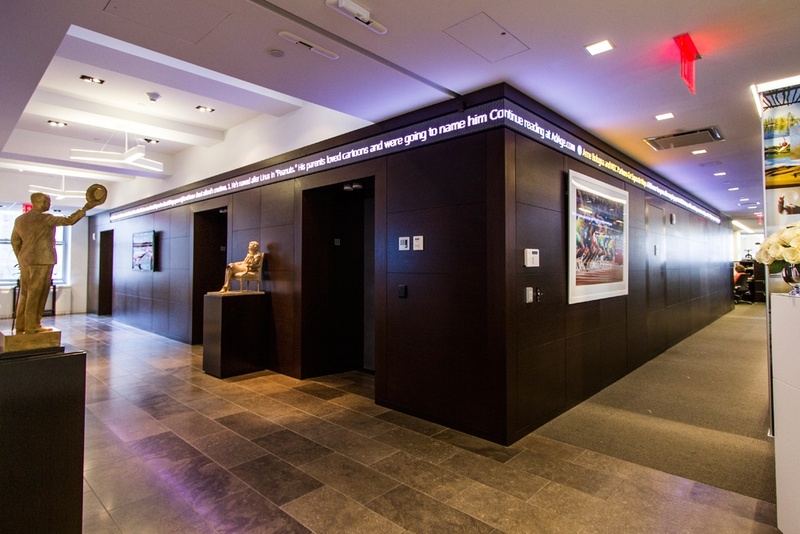 In addition, the space has a multitude of digital signage and interactive systems, along with a 75' LED "ticker" display that wraps around the reception and elevator lobby area. The Rise Display LED ticker is connected to a variety of publications, and delivers a live news feed, sports scores, tweets and other content on a continuous reel. The reception area features an 82" Professional LCD display mounted to the wall and connected to a Microsoft Surface Table, also developed by CP+B. The Microsoft Table allows a guest to sit down and interact with the table and its corresponding 82" LCD display. Audio associated with the table is reproduced via ceiling speakers above the seated participant. Content is streamed by MDC, spotlighting current tweets, quotes, photos and agency work. A "Greatness Wall,"” consisting of three specialized NEC LCD flat panel monitors and connected to a Tightrope Carousel digital signage system, gives MDC the ability to display 12 images simultaneously. The Wall is used to display the logos of all the MDC Partner firms on a scheduled digital video system. The NEC X431BT is a very unique 42" wide x 10" high, 24/7 rated, LCD display monitor. This allowed HB to give MDC the required 12 "logo squares" in 10"x10" formats. "MDC Partners is founded upon collaboration and mutual inspiration. The Innovation Centre is an illustration of that spirit. The team at HB Communications were exceptional from start to finish. This project was a big undertaking, and HB worked side-by-side with all the parties involved, actively involved each step of the way. We are thrilled with the results."